I have a child that absolutely loves the outdoors and I’m looking for a rental cabin somewhere in Utah, Wyoming or Colorado. I’m a rugged manual wheelchair-user so it doesn’t have to be totally accessible, but ramp access would be nice. I don’t need a lot of frills, but the cabin needs to be in a family friendly place. I don’t have a lot of extra money, so cheaper is definitely better. Do you have any suggestions for me? Although I don’t usually recommend Wasatch Mountain State Park (stateparks.utah.gov/parks/wasatch-mountain) to wheelchair-users, I think it might be a good fit for you. They have one accessible cabin — Falcon’s Ledge — which is located in a family friendly campground, near a group campground that’s frequented by boy scouts. The down side is, although the cabin itself is certainly very accessible, there aren’t a lot of accessible things to do in the park. On the plus side it’s a very affordable choice at just $60 per night, and you just can’t beat the view from the deck, because as the name implies, the cabin is perched on a mountaintop.There’s no dedicated accessible parking, but the parking spot reserved for the cabin is two spaces wide, and roomy enough for even the largest van. From the parking area, there’s a paved level path to the front porch, and barrier-free access to the cabin. 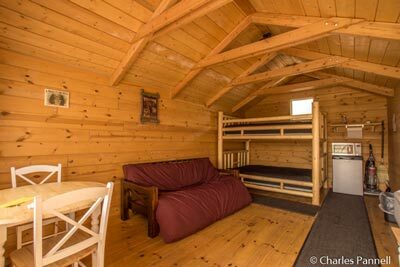 The cabin is furnished with a table and two chairs, a queen-sized futon, a bunk bed, a refrigerator and a microwave. It also has electricity, an air conditioner and a heater, but you’ll need to bring your own beding. There is a water pump outside, near the picnic table and the grill. That said, the picnic table is not on a cement pad, and it would be difficult to access in a wheelchair without assistance. 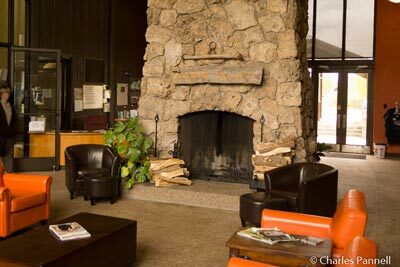 Accessible restrooms are located across the parking lot, just a short walk from the cabin. There is ramp access to the restrooms and there is an accessible stall with grab bars and a roll-under sink on both the men’s and women’s sides. An accessible bathhouse is located in the nearby Cottonwood Loop, but the road is a bit on the steep side, so it’s best to drive there. There’s accessible parking in front of the bathhouse with level access to the unisex accessible shower room, which features a roll-in shower with a fold-down shower seat, and a lowered showerhead and controls. Accessible sinks, mirrors and outlets are located just outside of the shower room, and there are also accessible restrooms with large stalls in the bathhouse. The Falcon’s Ledge Cabin can be reserved up to four months in advance at www.ReserveAmerica.com. There aren’t any accessible trails in this Utah park, but I do recommend stopping by the visitor center, as it’s located on the shore of a very peaceful pond. There are several picnic tables in the grassy area around the pond, and it’s a level roll out to them, so pack along a picnic lunch and enjoy the scenery. Even though it’s a visitor center, it’s also one of the quieter places in the park. And since you said you are a “rugged” wheelchair-user, you might be able to manage Huber Grove, where the historic Huber farmhouse and creamery still stand. Built in the late 1800s by the Huber family, the buildings have a step up into them, but they are still pretty interesting even if you don’t go inside. Getting there may be a challenge though. There’s no accessible parking near the apple grove, but the dirt parking lot is level. From there it’s just a short walk, but there is a large step up to the bridge that crosses the creek. If you can manage it, it’s worth the walk as there are some picnic tables in a level area near the grove. Give it a try, as the bridge is the biggest access obstacle, and if you can make it across, you’re good to go. If not, you can always head back to Falcon’s Ledge and enjoy the beautiful mountain view.